Have you noticed that costume parties seem a little more buttoned up these days? Some Halloween soirees almost feel like you're at a high tea of some sort. People dress up in well to do ensembles like they're at Marie Antionette's court or something. They're dignified in long gloves, blond wigs, and jaunty little bowties. Some of them even dress up as Marie Antionette! Here's the thing, Halloween is all about having a good time! We think it's time for you and your partner to shake things up with a knee-slap inducing ensemble. This backward backwoods inspired ensemble is sure to make an impression on all those hoity-toity revelers whether they like it or not! Pair up with your outdoor, mischevious partner and you two will have a couple's look for the books! 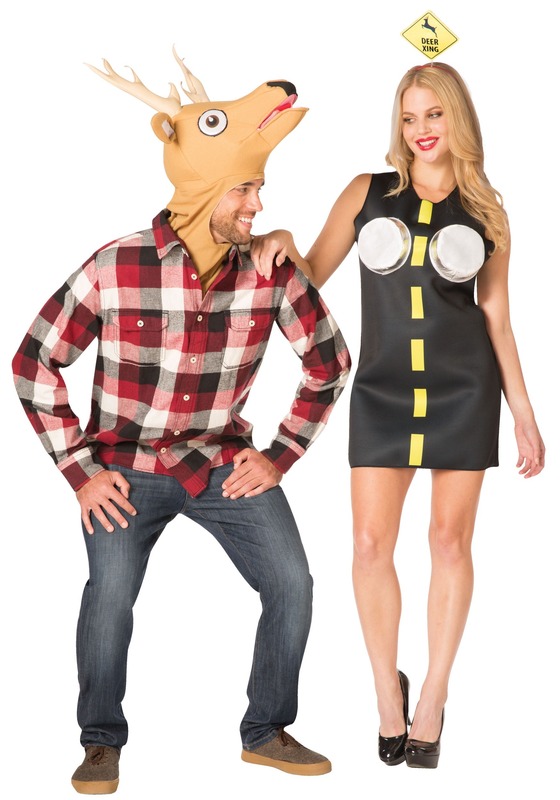 The deer head in this costume certainly looks stunned. The mouth is agape in headlight wonder and the eyes are wide as if they have caught sight of a pair of headlights on a dark night. The antlers are tall and the ears are three-dimensional so that you'll look like you're straight out of the woods. The road dress has a yellow stripe down the middle and lights on the chest. Top the whole thing off with a deer crossing sign just in case people don't get the concept. You're sure to add a little more buzz when you and your deer one appear on the scene together. We just hope the poor deer is going to be all right, he's looking a little displayed. We get it though, like a car coming for you in the night, it's shocking to realize you're about to have more fun than all those elegant brown nosers this Halloween. That'll show them. You can still be a stunner while having fun!